I get asked a lot of small business computer "how to" questions. Today I was asked how to access a Microsoft Access database file over the Internet, if the .mdb file is uploaded to a web hosting provider such as 1&1. After the "you're doing it wrong" part of the conversation yielded assurances they'd eventually at least upsize to MSDE, I forwarded a few URLs related to getting this bad idea working "as is". 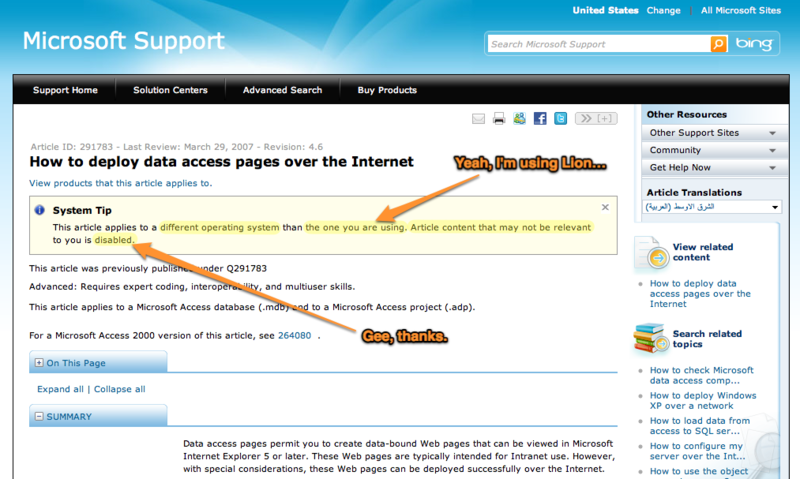 Not sure when this happened, but apparently Microsoft has decided that if you're not going to use the affected OS to browse for help, you aren't going to get to see the full knowledge base support info. Here's a System Tip for you, Microsoft: considering the number of IT folks supporting multiple operating systems from their workstation or running multiple OSes on their own machine in VMs, not to mention all the people helping other people, this is especially unhelpful. I suppose since I can't browse Microsoft's Support KB without running on the OS in question, that settles it... I'm ditching this MacBook Pro and getting a Dell.